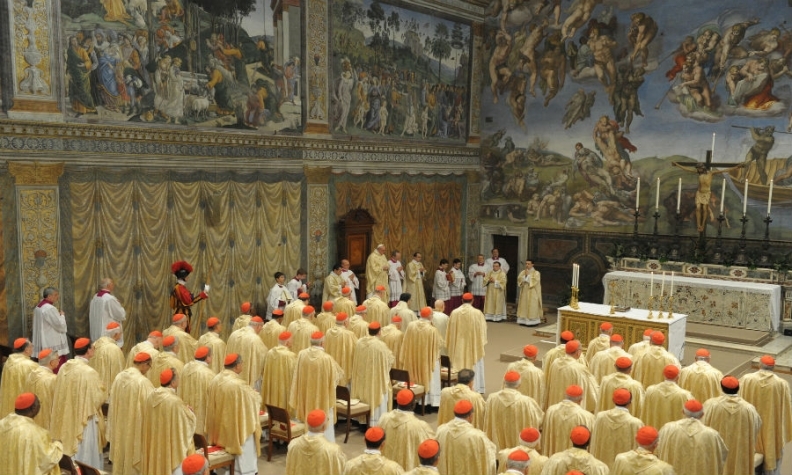 Pope Francis leads a mass with cardinals at the Sistine Chapel. Porsche is holding a concert and dinner for 40 guests in the chapel. ROME -- Porsche will be the first company to host a corporate event in the Vatican City's Sistine Chapel. On Saturday evening, some 40 guests paying 5,000 euros each will listen to a classical music concert, followed by a dinner in the museum "surrounded by masterpieces by world-famous artists such as Michelangelo and Raphael," according to a program on the Porsche Travel Club's website. Pope Francis has allowed the chapel to be rented out for private functions, with the proceeds going to charities working with the poor and homeless, according to press reports. A Porsche spokeswoman declined to provide details about who will attend the concert, which will be followed by other events around Rome including two days of driving. About 6 million visitors a year visit the Sistine Chapel to admire Renaissance artist Michelangelo’s painted ceiling. Concerts have been held in the Sistine Chapel before, but usually for church-related activities. Pope Francis will not attend the Porsche event. Pope Francis called for a “poor church for the poor” after his election last year, and has distanced himself from the luxury that traditionally surrounds church leaders. He lives in a simple apartment and has opened up the Vatican Gardens to the public.